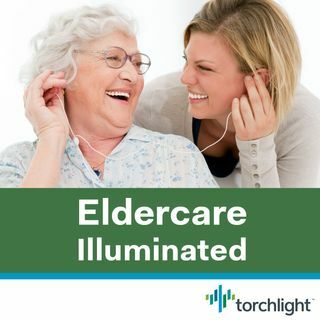 In this episode of Eldercare Illuminated, host Lenore Tracey speaks with attorney Eric Carlson about the problems that nursing home residents and their caregivers may face — and what to do about them. Nursing homes throughout the country are bound by federal laws that are designed to ensure a person-centered, homelike experience for their residents. As Eric points out, even “good” nursing homes may have practices and procedures that violate federal law. This podcast offers insights and ... See More practical assistance to help caregivers advocate effectively for their loved ones' rights as nursing home residents. Eric Carlson is the Directing Attorney at Washington D.C.-based Justice in Aging. Formerly the National Senior Citizens Law Center, since 1972 Justice in Aging has worked for almost 50 years to address the health and economic security needs of older adults with limited resources. Eric has experience in many forms of long-term services and supports (LTSS), including home and community-based services, nursing facility care, and assisted living facilities. He led Justice in Aging’s extensive research (funded through The Commonwealth Fund) on Medicaid-funded assisted living and currently is leading a project to assist consumer advocacy on Medicaid managed LTSS in Florida and New Jersey. Eric also serves as President of the national Assisted Living Consumer Alliance and is author of the legal treatise Long-Term Care Advocacy (Matthew Bender and Co.). Stories from the Field (link - http://www.justiceinaging.org.customers.tigertech.net/wp-content/uploads/2015/06/Stories-from-the-Field.pdf) , a guide for nursing home residents and their loved ones to recognize and address issues that LGBTQ+ individuals may encounter.